The detail shown below is from an engraving of a much larger map of the Indian Country made by Guy Johnson in 1771. It conveys a sense of the huge geographical area of Albany County at its largest - from New England to the Indian Country and from Kingston to Canada! At that time, Albany County had a population of 42,706 - giving it almost twice as many settlers as any other New York county. On the eve of the American Revolution, New York perhaps was the seventh most populated North American colony with 168,007 European and African ancestry settlers. By the time of the first Federal Census in 1790, it had jumped to fifth in the United States with 340,120 people. 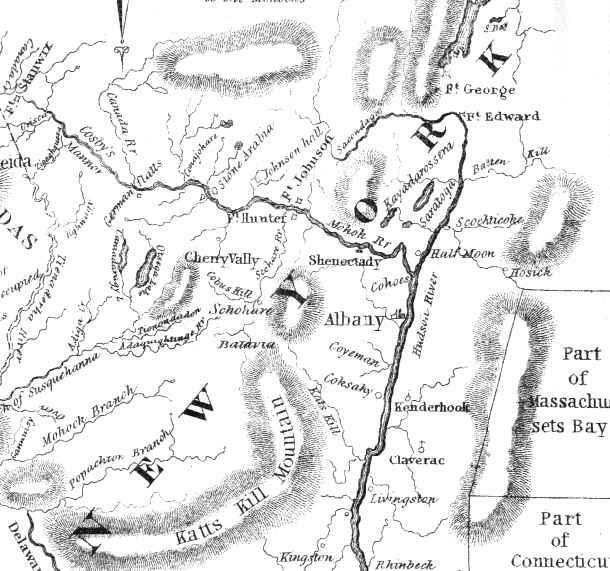 Because of its simple clarity, we use this map as a canvas to illustrate the settlement landscape of the upriver region of New York at the end of the colonial era. Albany's Fort Hunter holdings are located where the Schoharie Creek flows into the Mohawk. Contrast this drawing with the Sauthier map of a few years later! Guy Johnson was the Irish-born nephew, son-in-law, and protege of Sir William Johnson. He came to America in 1756, fled to Canada in 1775, and died in England in 1788. He was a soldier, surveyor, secretary to his uncle, and frontier diplomat. In 1763, he married Sir William's daughter, Mary. This frequently reproduced map was addressed "To His Excellency William Tryon Esq., Captain General & Governor in Chief of the Province of New-York. This Map of the Country of the (Six) Nations Proper, with part of the Adjacent Colonies is humbly inscribed by his Excellency's Most Obedient humble Servant Guy Johnson 1771." The engraved version shown above was printed in The Documentary History of New York, 4:1090. In 2008, a nicely reproduced copy of the document appeared online.